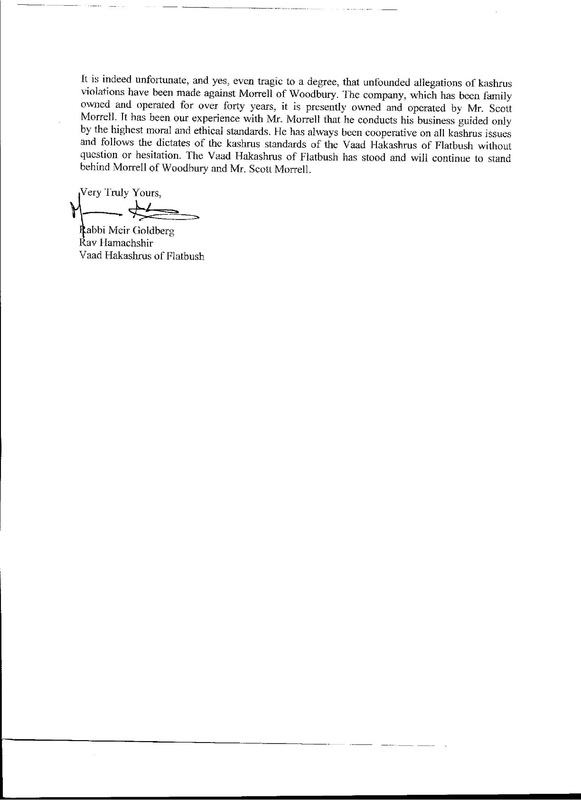 The ups and downs for Morrell Caterers: Below you’ll find The Jewish Week article and further below, you’ll find the Vaad of Flatbush letter about Morrell Caterers current standing after the Vaad’s investigation. 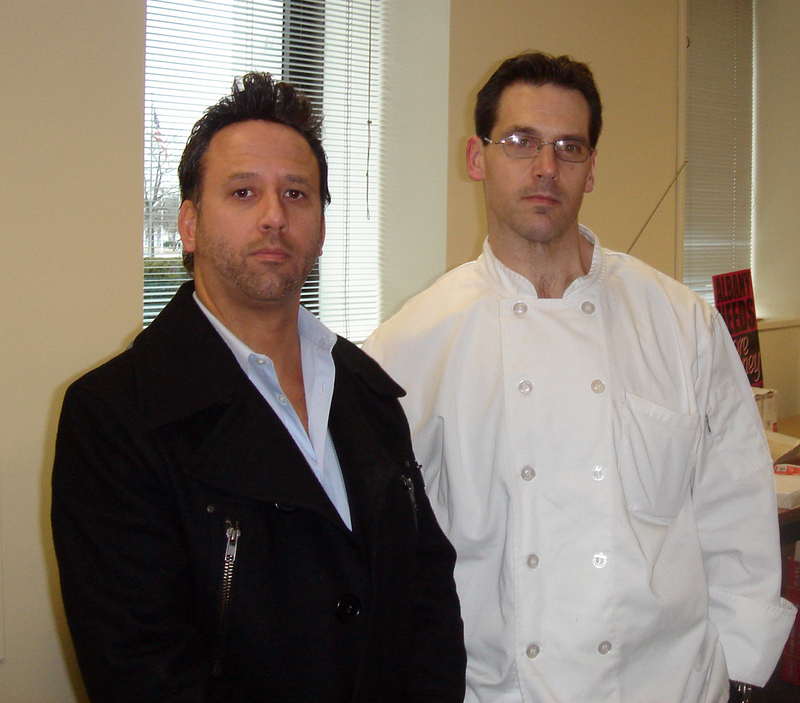 Morrell Caterer’s former general manager Thomas Cataldo, left, and former executive chef Michael Savitsky. Nassau County District Attorney Kathleen Rice has opened a criminal investigation into allegations that Morrell Caterers of Woodbury, L.I., prepared shrimp, lobster, pork and other non-kosher food in the same kitchen as kosher food. Chris Munzing, a spokesman for Rice, said the investigation started this week after it was reported that two of Morrell’s former employees filed a civil suit alleging that Morrell started a non-kosher business in the kitchen of Temple Beth Torah in Melville, L.I. They said it was begun in September 2010 in conjunction with a high-end event planning company, Pat Glenn Productions. Zornberg added that his congregation’s executive board would be meeting Sunday to further discuss the situation. At the press conference, Morrell said he would “consult with my rabbinical supervisor” to decide what to do about the silverware, pots, dishes and cooking utensils that were allegedly used for both kosher and non-kosher affairs. “I regard kosher supervision with the highest priority,” Morrell said. 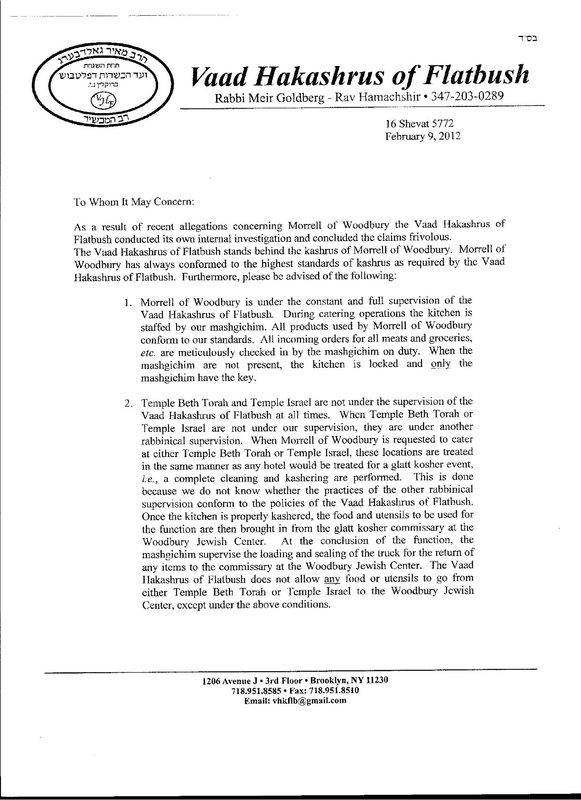 Rabbi Moss, spiritual leader of B’nai Israel Reform Temple in Oakdale, L.I., stressed that he made regular spot inspections of the kitchens of Temple Beth Torah and Temple Israel in Lawrence, L.I., but was not employed to be there full-time. Morrell’s lawyers, Steven Schlesinger and Ronald Rosenberg, claimed that the civil suit brought by the two former employees was part of a failed shakedown attempt to get Morrell to drop a $500,000 suit against Morrell’s former lawyer. They said the two former employees, Thomas Cataldo, the former general manager, and Michael Savitsky, the former executive chef, were paid by the former lawyer to make the allegations. Both men denied it. And Rosenberg questioned why it took so long for the two men to come forward. Both Cataldo and Savitsky said they had complied with Morrell’s orders because they feared for their livelihood. “He told me in no uncertain terms that this would continue,” Cataldo said when he protested what was happening. He said that food for between 25 and 30 off-site non-kosher parties costing at least $200,000 were prepared in the Temple Beth Torah kitchen. He said that although the bills were processed through Morrell Caterers, they were concealed from the synagogue to avoid paying synagogue fees. Savitsky said he recalled that on at least one occasion his staff was ordered to prepare both kosher and non-kosher food in the kitchen at the same time. They said they acted to blow the whistle now because they could no longer stand the “guilt” of what they were doing. Cataldo said in an affidavit filed with the court that he and Savitsky each owned a 5 percent share of the business. And in a court affidavit, he said Morrell Caterers “has no cash, is struggling to make payroll” and owes a key supplier more than $250,000. Cataldo said that although all of the non-kosher food preparation was done at Temple Beth Torah, utensils, pots and pans, plates, glassware, display pieces and other items were routinely taken to Temple Israel in Lawrence for use there.